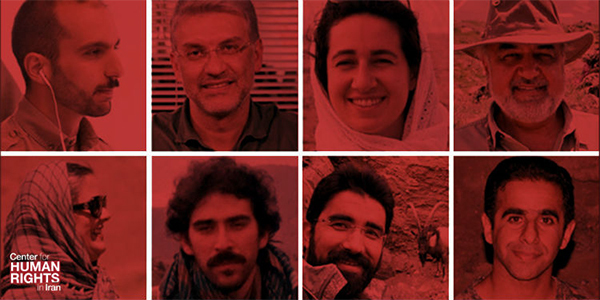 January 24, 2019 – Some of the conservationists who have been imprisoned incommunicado in Iran for the past year have been forced to confess under the threat of death, the Center for Human Rights in Iran (CHRI) has learned. New details about the prolonged detentions of Houman Jowkar, Taher Ghadirian, Morad Tahbaz, Sepideh Kashani, Niloufar Bayani, Amir Hossein Khaleghi, Sam Rajabi and Abdolreza Kouhpayeh strongly indicate that Iran’s judicial officials have been working closely with the Islamic Revolutionary Guard Corps’ (IRGC’s) Intelligence Organization to build cases against them based on false confessions obtained under extreme duress. “Some of the detainees were also physically beaten up… all to force them to give false confessions against themselves,” added the source who requested anonymity for fear of reprisals by Iranian security forces. “Forced confessions won’t conceal the fact that these detainees’ due process rights have been trampled on while hardline judicial and security forces have been trying to manufacture cases against them,” said CHRI’s Executive Director Hadi Ghaemi. Agents of the IRGC’s Intelligence Organization arrested nine conservationists working for the Tehran-based Persian Heritage Wildlife Foundation (PHWF), which had been licensed to operate in Iran by the government, between January 24 and 25, 2018. While detained in Evin Prison for interrogations, the PHWF’s Managing Director Kavous Seyed-Emami, an Iranian Canadian conservationist and academic, died two weeks later under suspicious circumstances on February 9. Officials claimed he committed suicide but a preliminary autopsy report that omitted his cause of death showed “bruises on different parts of the body and evidence of an injection on his skin,” said a lawyer representing the Seyed-Emami family. No final autopsy report has been made public 12 months after his death. Just four days after Seyed-Emami’s death while his case was still making international headlines, Tehran Prosecutor Abbas Jafari Dowlatabadi accused him on February 13 of engaging in espionage. He and his family were also smeared in a film made collaboratively by Iran’s IRGC and Islamic Republic of Iran Broadcasting that was aired on Iran’s state-run TV.While his family was in the early stages of grieving, they were threatened with harm by security agents if they spoke to the media about the case. Seyed-Emami’s wife, Maryam Mombeini, was repeatedly interrogated so aggressively that she was hospitalized for a nervous breakdown and banned from leaving the country despite calls by the Canadian government for her to be allowed to travel. “Instead of holding anyone accountable for Seyed-Emami’s death, Iran has subjected his colleagues to 12 months of abuse while violating their right to counsel,” Ghaemi said. The source who confirmed to CHRI that some of the PHWF staffers have been “subjected to immense pressures to give false confessions against themselves and others” did not indicate exactly how many were forced to make statements incriminating themselves. On October 24, 2018, Dowlatabadi said indictments against all eight detainees had been completed and would soon be submitted for trial. He added that charges against four of the accused, whom he did not name, had changed to “corruption on earth,” which could carry the death penalty. It is unknown whether any of the conversations have since been tried. On November 8, Gholamhossein Esmaili, the chief prosecutor of Tehran Province, pointed to the “camera traps” the conservationists had used to track wildlife in Iran including the endangered Asiatic Cheetah as evidence that they were spying. In fact, the cameras—standard professional equipment commonly used in the field—are an “essential tool in providing a critical basis for both science and conservation strategies to save species from extinction,” said dozens of conservation practitioners and scholars including renowned primatologist Jane Goodall in a November 2018 open letter. “Some of us are ready to provide evidence and witness testimony upon request,” added the signatories in the letter addressed to several Iranian officials including Supreme Leader Ali Khamenei, head UN envoy Gholamali Khoshroo and Judiciary Chief Sadegh Larijani. The conservationists’ cases have been shrouded in secrecy other than occasional accusations or comments by judicial officials run in state media outlets. The informed source that spoke with CHRI confirmed that the detainees have been subjected to prolonged periods of solitary confinement and only sporadically granted severely limited access to counsel or phone calls with family members. “They have had no legal representation for the entire duration of their arrest until the indictments were issued in late July ,” the source told CHRI, adding that after “one year of effort,” their families were finally allowed to choose lawyers for them in January 2019. “They have no clue about what is happening outside, and express their immense stress of isolation… and continue to voice their innocence,” added the source. As in the case of Seyed-Emami who died in state custody, Iranian state-run TV has repeatedly run sensationalist news reports and comments by hardline judicial officials all aimed at smearing the detainees, who have been denied the right to respond or speak freely to defend themselves. “The government’s fact-finding committee concluded that the detained activists should be released because there’s no evidence to prove the accusations leveled against these individuals,” he added. CHRI calls on the Iranian judiciary to dismiss any “confessions” or statements obtained under duress and adds its voice to the growing chorus of calls from inside and outside Iran for the conservationists to be granted a fair trial and released immediately. “Iran has held these women and men in near isolation for a year while it has been cooking up cases against them,” said Ghaemi. “Yet emerging details tell a very different story of a group of conservationists being smeared and pressured to make false statements against themselves while being denied access to counsel,” he added.